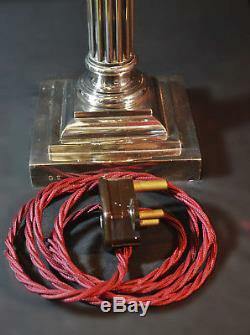 Up on offer here is this stunning and very Iconic Edwardian C-1910 Large Military (Lancashire Fusiliers) Silver plated Corinthian officers desk lamp with the Regiments official badge stamp engraved and a monogram association. 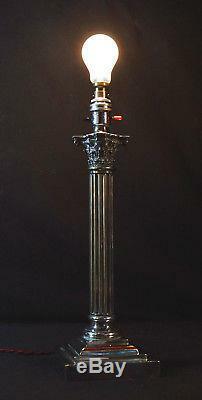 Superb piece of British Military lighting history.. "Please scroll down for details". 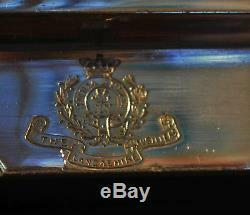 Very impressive piece of British Edwardian military history with official identification engraved. 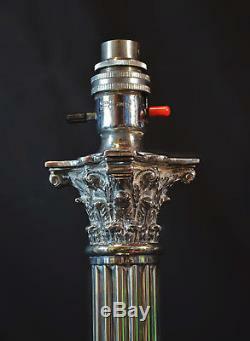 Silver-plated throughout and in beautiful condition despite a 100+ years of service. 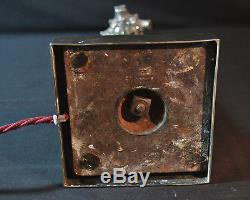 Original multi-patent switched plated bulb holder with side shift switch mechanism. 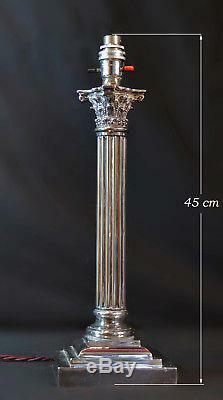 Large Multi-step base with Large original cast steel stabilizer base plate. Re-wired in three-core silk braided twist cable, and in perfect working order. 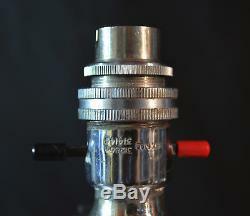 1930s large MK three round pin Bakelite plug. 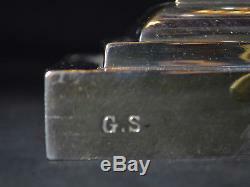 An associative monogram (GS) engraved to the side of the base. Believed to have been presented for gallantry to Lieutenant Colonel G. (George Stanley) Brighten, Liverpool Regiment, attached to the 2nd/5th Battalion of The Lancashire Fusiliers in 1914, but since we have no documentary evidence to support the hypothesis, you are asked to conduct your own research and draw your own conclusion regarding the attribution. Fitted with a very smart 1970s silk braided and lined six segment scallop Empire shade with a built-in harp carrier. Single E22 bayonet fit bulb. 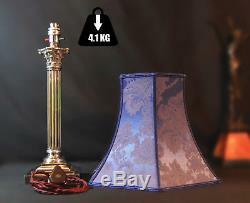 Weighing 4.1 KG, the lamp Stands at 45 cm tall without the shade. Base dimensions are 15 X 15. Modern wall socket adapters are widely available. In Beautiful condition with minimum noticeable signs of age related wear commensurate with its 100+ years of service; some small unevenness to areas of the base. Even though the lamp is Fully UK wired and in perfect working order, To comply with local legal & safety regulations, It is buyers responsibility to check with a qualified person whether or not any usability alteration will need to be made to wiring or fittings to suit buyers local use. Please study all the images, which form an integral part of item description, and then if you have any questions, please dont hesitate to ask. 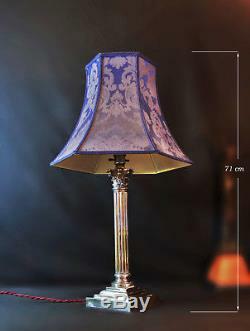 Please see More vintage lighting in my light shop. We Provide Risk Free Shopping Experience. Please be sure to Add me to your favourites. CHQ drawn on UK bank dispatch after clearance. 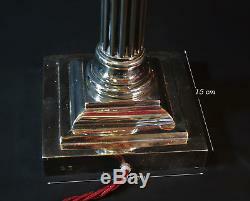 The item "Lancashire Fusiliers Large Edwardian silver-plated Military Corinthian desk lamp" is in sale since Thursday, June 7, 2018. 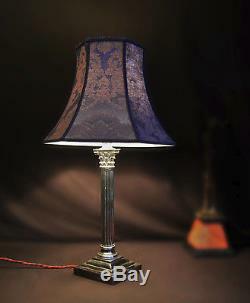 This item is in the category "Antiques\Antique Furniture\Lamps\Edwardian (1901-1910)". The seller is "mannyman0_1" and is located in Manchester. This item can be shipped to United Kingdom, Austria, Belgium, Bulgaria, Croatia, Cyprus, Czech republic, Denmark, Estonia, Finland, France, Germany, Greece, Hungary, Ireland, Italy, Latvia, Lithuania, Luxembourg, Malta, Netherlands, Poland, Portugal, Romania, Slovakia, Slovenia, Spain, Sweden, Australia, United States, Canada, Brazil, Japan, China, Israel, Hong Kong, Norway, Indonesia, Malaysia, Mexico, Singapore, South Korea, Switzerland, Taiwan, Thailand, Chile, New Zealand.